Double kayak tours are a great for bonding and a great team building exercise for corporate functions. 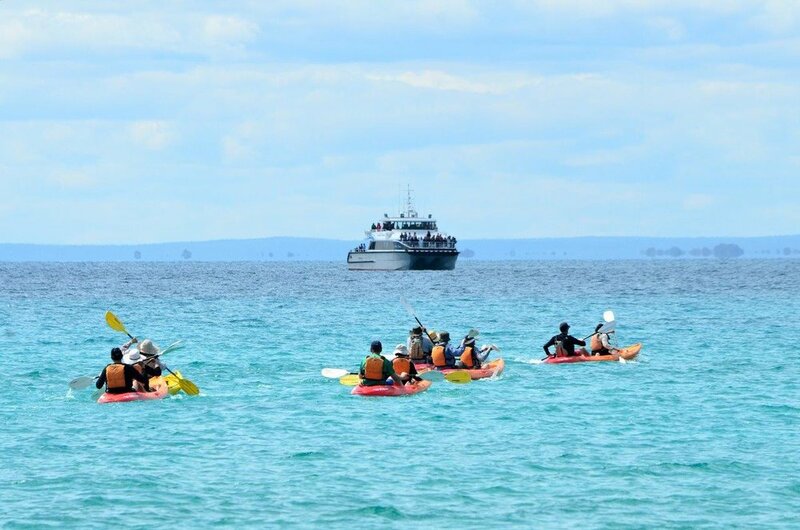 Meelup Beach hire runs guided kayak tours throughout the Meelup Regional Park. You will see rocky out crops, coastal trees and secluded beaches. Whales and dolphins are frequently spotted in October and November. Our tours are usually two hours long with a short break at an isolated beach, where you can stretch your legs and have a swim. WE PROVIDE: Double sit-on-top kayaks, paddles, PFDs (lifejackets), qualified experienced guides, light snack. Please Bring Drinking water, sunscreen, sunglasses, bathers/boardies, waterproof camera. Phone on 0497 085 123 to make a booking.